Did you know that we provide an extensive range of door hardware available through our BIG J Doors and Fixings brand? This allows us to provide a fully complete and customised final product, including various handles, locks, knobs and stops. We have developed a series of exclusive levers to perfectly compliment our internal doors. The mineral range is designed and developed in house, ensuring compatibility and opulent styling. D-Pull handles add a sense of style and luxury to your cabinetry and can really elevate an area. T-Pull handles add a similar stylish finish to cabinetry as the D-Pull, with the variation of a T style. The smooth finishing creates a luxurious modern feel. Flush Pull handles are a smaller and subtle addition to the home that add functionality and class. We offer a range of secure internal and external locking solutions to provide privacy including latch sets, entrance sets, passage sets and privacy sets. Our range of wall mounted door stops are not only functional but look great. Protect your walls with style. We can even include all required hardware in the same order as your Canterbury Timber and Southern Star Aluminium windows and doors for convenience. 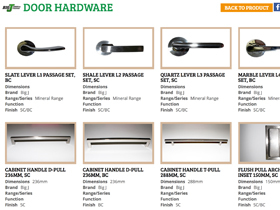 Visit our website for more information and to view the full range of door hardware offered by BIG J Doors and Fixings. *Limited range available in QLD and NSW, speak to your sales representative.